The concept of warehousing data goes at least as far back as the late 1980s when researchers at IBM coined the term “Information Warehouse”. In 1991 W.H. “Bill” Inmon published a book called “Building the Data Warehouse”. This book helped individuals and companies develop their own internal data warehouses. The basic concept of a data warehouse is to collect and store data from various business entities, for analysis, and report development. Data warehouses typically store their data in relational databases, so that the data can be queried and aggregated between various tables from diverse business units. According to the website Webopedia, data marts are “A database, or collection of databases, designed to help managers make strategic decisions about their business.” Additionally, they go on to explain that “data marts are usually smaller and focus on a particular subject or department”. Conceptually, Data Junction is very much like a data mart, in that it’s typically used for a particular subject or department. However, the advantage of Data Junction is that there is no database that needs to be designed to maintain tables. Therefore, there are also no queries that are needed to obtain the data. Data Junction is software that collects data from various nodes, and stores that data in a file system. This data can be stored as compressed files in order to save valuable hard drive real estate. Google type searches can be manually performed on the files in order to determine what type of data is available. This makes it much easier for an individual to retrieve data from their systems. There is no need for them to learn a complex query language, or cryptic regular expressions. 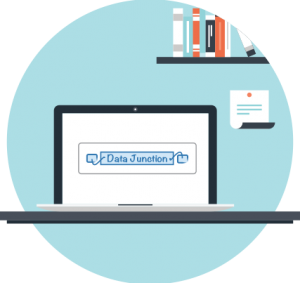 In addition to the ability for users to access Data Junction and look through various raw files, or files that are stored in a flat table format, Data Junction also allows for other computer systems to access its files. In this way, Data Junction is acting as a switchboard, making connections to various nodes to obtain data, parsing that data, and sending it through to other systems that have use for the data. In telecom networks, nodes are the crucial elements that make communication possible. Due to their key role, numerous applications need access to obtain data that resides within these nodes. Data Junction provides companies with the ability to gather that data and distribute it various applications as needed. Data Junction performs its job by providing a node centric approach to gathering the data. By making the nodes the focal point of the system, they are given the level of attention and respect that they deserve. The advantage of this approach is that it helps to insure data integrity. For example, in many data warehouse solutions, gathering data from network nodes is a functionality that’s provided on a one off basis and little attention is given to node connectivity issues, and missing or outdated data. Accessing Data that resides within Data Junction is one of the foremost functionalities of the system, and as easily obtained as it is on the web. Many systems require experts of the database to go in and help others retrieve information that’s trapped in obscure tables, often requiring a specialized query language to retrieve. Data Junction allows users to input text searches that return both raw and parsed tables. This allows the users to see all data from a node related to a particular text search, rather than just the data that was parsed and put into a database table. The ability for anyone that’s given access within an organization to search this data is unprecedented, and the benefit is that it will provide engineers as well as business analysts and project managers the ability to research the data that they need to feed any other project or application of their choosing. Since Data Junction stores its data as compressed files, the number of files on the system is limited by the hard drive space available on the system. Data Junction has the ability to connect to thousands of nodes of various makes. It can connect to switches, routes, HLR’s, ISBC’s, Media Gateways, Border Gateways, telemetry devices, individual computers, and even individual applications. Data Junction can connect to anything that could be considered a node, and that has valuable data that needs to be accessed and retrieved for use by other applications. Data Junction has many additional features that make it superior to other data storage and distribution systems.